It can be easy to see why customers enjoy eating out at restaurants. It’s a chance to get out of the house and enjoy being served some food. It’s a nice way to relax and unwind with family and friends. So, why would your customers want to order their food online to be delivered to their home? Well there are a number of reasons as to why your customers like ordering their food online, and knowing these reasons can help you to make your online menu more attractive to them. One of the first reasons why a customer may be more interested in ordering online than dining in is that they’ve had a long day and just want to go home. It’s easier for them to get over the day that they had by being able to stop by for a food pickup or have the food delivered. They are able to have food right when they get home to eat without having to worry about cooking or the clean-up that comes afterwards. In fact, depending on the way that you package your takeout food, the customer may even use it as their dishes making clean-up a breeze. This takes a lot of stress and strain out of their day. The next reason is that they have company coming over to their home. Maybe they waited too long to get the house clean, so to make up time, they decided to order in food to serve to their guests to not have to worry about it. Maybe they decided that a meal from a great restaurant like yours would be the best way to impress their new client or other visitor. Maybe they are the type of person that can burn water and order in to save face when it’s their turn to host the dinner party for your group. No matter their reason for wanting to serve their guests take out, your restaurant is there to take up the slack. 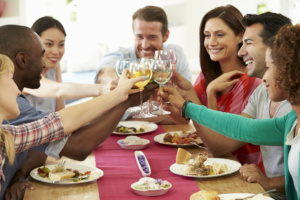 The best part of this reason is that it may mean that your meal becomes an instant hit making everyone want to know where the hosts got it from. You may score some more customers ready to dine in or order take out thanks to your online ordering efforts. One word: children. Parents love their kids, but sometimes, it can just be easier to order in food. Kids can be loud and antsy. There are plenty of news stories that get picked up from social media or other sources about how something went wrong with children at a restaurant. It can seem like a good idea to eat in, and at first, the crayons and coloring menu can keep them occupied. Some waitstaff is excellent at making sure that some kind of snack or food comes out relatively quickly to keep their attention, but on busy days, there’s a good chance that before the food comes out, the boredom may set in for even the best kids. For many parents, it’s just a safer bet to place that order online and have it delivered at home where the kids can be as loud and crazy as they normally are while waiting to eat. This ties into the above reason, but for some parents that cannot find a sitter for date night, they just stay in. After the kids go to bed, they put in a movie to enjoy and sit down in front of the television with their takeout or maybe they put some music on, light some candles, and eat at the dinner table like a civilized people. The food you provide makes it feel as though they were able to go out, and gives them an opportunity to not have to worry about cooking or clean up. A perfect date night without having to pay a ransom for a sitter is always a welcome change. Sometimes your customers come home to find that there isn’t anything in the kitchen to cook for dinner. That means either they have to get back in their car and go to the grocery store, or they can take a few moments and do an online search to have food delivered after finding the best restaurant. The convenience of being able to not have to leave is worth a lot to your customers, and they are going to love having their favorite foods dropped off. There you have it. There are plenty of reasons as to why your customers enjoy ordering food online for pickup or to be delivered to their home. These are great starting points to help you pinpoint why your customers are open to ordering from your website online. You can brainstorm some ideas for your online menu, and start putting them into action. Contact us today if you’re ready to set up online ordering for your website to start taking advantage of customers that prefer delivery and pickup options rather than just eating in.